In a mixing bowl, combine the flour and salt. Using a pastry blender, cut in the butter until the mixture is the size of small peas. Sprinkle water over, a tablespoon at a time, stirring lightly with a fork. Add water until dough is just moist enough to hold together. Form the dough into a ball and then divide into 2 pieces. On a lightly floured surface, flatten one of the balls into a disk. Roll out a circle 1 inch larger than the pie pan you are using. Fold pastry in half, transfer to pie pan, unfold, and fit loosely into the pan. Trim the dough even with the edge of the pie pan. Pour evenly into the prepared pie shell. Roll out the top crust in the same manner as the bottom crust. Cut slits in the crust for the steam to escape. Place top crust over filling. Fold the edge of the top crust over the bottom crust. Seal and flute edge. For an attractive shiny top crust, brush with milk or egg beaten with a little water. Sprinkle with sugar, if desired. 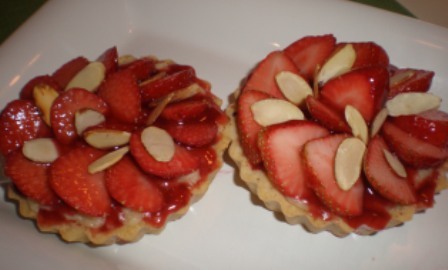 Bake 35 to 40 minutes, or until the crust is golden brown and fruit is bubbling. Serve warm or chilled. 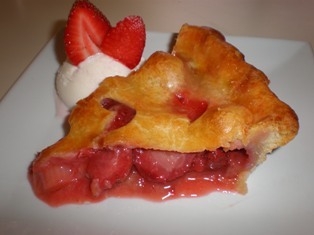 Strawberry-Rhubard Pie combines sweet juicy strawberries with tart, crisp rhubarb for a special springtime dessert. This pie container holds up to an 11" pie plate. It's deep enough to accommodate tall meringues or fancy cream pies.